Please take a few minutes out of your busy day and stop into our Flower Shop here in Blaine, MN. We guarantee that the sights, aromas, and sounds will calm your day. While you are here, step into our fresh flower cooler and select some stems of flowers for a loose arrangement. We sell all of our flowers by the stem. Choose individual stems or packs of flowers to make your own bouquet. We always have a wide selection of fresh flowers in our flower coolers. All at your fingertips to pick-up. Also, you can let one of our floral designers put together a bouquet too, if you'd rather just point out some of the flowers you like- we'll do the rest. 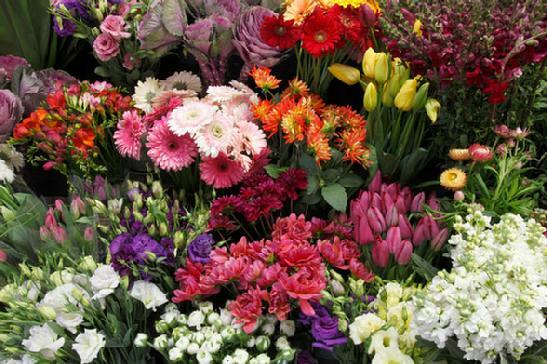 We always have our coolers full of many varieties of flowers: roses, daisies, exotic tropicals and so many more. We always have loads of Uber-fresh flowers in our walk-in flower cooler. Stop in when you are in a hurry. We'll get them together for you in a jiffy. Your loved one's will thank you & never know it was a last minute gift! 1. Recut flower stems & change the vase water daily. 2. Sanitize vase before use. Use bleach, or run through dishwasher. Don't use dish soap as it plugs flower stems. 3. Remove any leaves that will be under water in vase. Telling someone you care about them is heightened with the addition of flowers, either in a vase or wrapped up for them. We've been in business for over forty years, providing fresh cut flowers to walk-in customers and taking flower orders over the phone for delivery in the Minneapolis area.